Mission Statement: The mission of the Le Center Police Department is to provide the citizens who reside and work in Le Center the safest environment possible by utilizing the core principles of community policing and working together with the citizens to improve the quality of life while still enforcing the law! We understand that crime and the fear of crime can best be reduced through the employment of a well-rounded approach that consists of prevention, intervention, and enforcement. We also understand that keeping a community safe is based on the support and involvement of the community; thus, we constantly strive to enhance our relationships with the community through communication and prevention. In addition, the Police perform innumerable services rendered in take interest of protection, safety, and convenience to the public. They maintain a close liaison with other law enforcement agencies throughout the State of Minnesota, Le Sueur County, and neighboring communities. Police personnel respond to calls for medical assistance, citizen transport, industrial accidents, actual disasters, aid to other departments, house checks, park checks, and other calls for service or aid to the public. Have questions about reporting crime, crime prevention and more? Visit our Frequently Asked Questions page for answers. 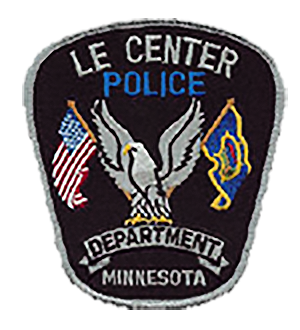 Welcome to the City of Le Center Police Department section. We are a growing department dedicated to our community and its safety.